Working trials have three levels of stakes: Novice, Open and Winner. These trials are not competitions but the dogs receive a written quality judgement. The dogs that fail receive a „0“. The dogs working through the whole trial are awarded a third prize (3) satisfactory, second prize (2)good, or for excellent work a first prize (1). With one „firsts“ from a novice trial the dog may enter open stake. With one „firsts“ from open stakes the dog is transferred to the „winner“ class. Marking: The dogs must remember one, two or three marked retrieves. 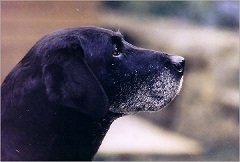 Blind retrieves: The handler must be able to handle the dog to the game. Hunting: The dog must find game without the handler’s assistance. Tracking: The novice class dogs must find a rabbit or hare in the end of a 200 m long trail. The trial is held in a terrain suitable for wildfowling. Part of the game is imagined to have dropped in water and part on land. The terrain and vegetation in water should be chosen according to the class. Marks are thrown, the other game is hidden in the terrain in advance. The dog must have a possibility for at least six retrieves. At least three shots are fired with a shotgun during the test for each dog. The excercises should simulate actual hunting as well as possible and suited to available terrain. The novice class trials are held in relatively easy terrain, the dog visible most of the time. Water area should allow swimming with moderate effort. The dogs must remember only one marked retrieve at a time. The blind retrieves do not require complex handling. The open class dogs may have to remember two marked retrieves. Blind retrieves are mostly in water. The dogs must hunt on land and in water. The winner class trials are made more demanding. The dogs may have to remember three marked retrieves. Wide variety of excercises are arranged. Terrain and water area should be physically challenging. Distractions may occur by scent, in retrieving order etc. Pair work may be arranged. a second (2) quality prize in a championship show.